Fans wanting to pigeonhole Mouth’s music, do so at their own risk. The three-piece Kansas City band combines elements of funk, jazz, pop, hip hop, electronica and progressive rock in their unique, dance-friendly instrumental songs. Talking with the band, which also includes bass player Zach Rizer, is like trying to catch a ping pong ball in a shower stall. The three are just as in synch in conversation as they are when playing. Words zip around as the three finish each other’s sentences and try to complete their own thoughts. They also provide a nice business model. Mouth tape all of their shows and try to saturate the market with recordings in hopes that the music will find its way out ahead of the band. Mouth – the name is a play on the fact that there’s no vocalist – perform in Springfield, Mo. on Saturday and will celebrate their first birthday on Jan. 29 at the Jazzhaus in Lawerence, Kan. One year ago the trio was playing a First Friday art exhibit and dipping their toe into the scene at the Jackpot Saloon. 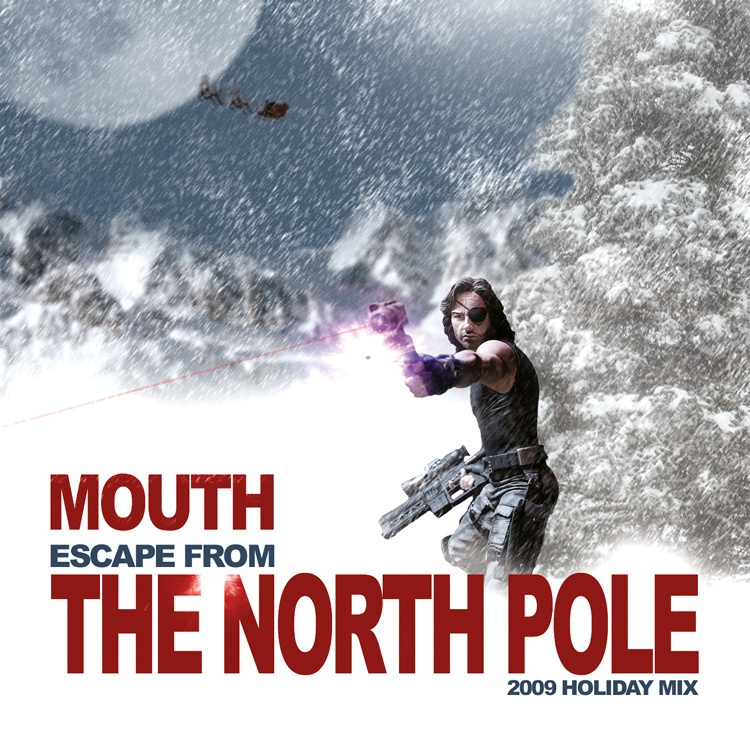 Download the Mouth album "Escape from the North Pole" for free at http://www.abandcalledmouth.com/music/. “I don’t know if I’ll be able to get a cake in, but I want to make party favors, maybe put songs on a CD and give them out,” Anderson said. Several friends of the band, including guitarist Matt DeViney, who co-founded Gunn’s previous band Groovelight, and local MCs Reach and Phantom will also help celebrate with the band. Although hip hop is now a staple of the band’s catalog and all three members were longtime fans, embracing the genre was purely a business decision. After six months of drawing meager crowds, Rizer looked at what was getting covered in the music press and where people were going and decided hip hop was the way to go. As soon as they made the switch, they attracted some attention in The Pitch. They also started growing unexpectedly as musicians. For Anderson it was a chance to add his favorite elements of progressive rock – long, intricate parts – and incorporate them in a hip hop setting. The members of Mouth grew up in musical families. Anderson’s little brother got a guitar, but never played it, so the 10-year-old started noodling on Steely Dan and King Crimson licks. Gunn grew up immersed in music. His dad was a drummer in the band Heat Index and moved out to California in his ‘20s to pursue a career in music. The white bass drum in Gunn’s kit was originally part of his dad’s rig. Rizer’s father was also a musician. His dad and grandpa, both named David Rizer, were jazz musicians. Grandpa Rizer played guitar with Oscar Peterson and Charlie Parker. David Jr. plays trumpet, bass and sings and plays regularly with Everette DeVan at the Blue Room. At Shawnee Mission Northwest High School, Anderson introduced Rizer to rock and roll, while Rizer shared his love of funk, soul and jazz. Gunn, meanwhile, forged his own path, eventually performing at Wakarusa Music Festival with Groovelight in 2005. One number the trio play is “Bad Wolf,” a new song that takes its name from Doctor Who. Anderson is seated, bent over his guitar, his nimble fingers dancing across the frets. When told his playing is reminiscent of Adrian Belew, he humbly replies “It should. I have his guitar and amp.” As Rizer’s groove takes over the melody, Gunn applies a hip hop/reggae rhythm on the drums. There’s very little eye contact; each musician lost in his own world. After a year together, Mouth has no future goals beyond continuing to push each other and trying to find a balance between the written and improvised. Chances are good that Chicago-based music writer Bill Dahl has penned the liner notes to at least one of your favorite reissues or compilations. Since 1985, Dahl has been commissioned to write the notes for hundreds of blues, R&B, rockabilly and rock collections on both major and boutique labels. In 1998, Dhal was recognized with a Grammy nomination for his essay on Ray Charles’ sax section included in the “Ray Charles – Genius and Soul: The 50th Anniversary Collection” box set. In 2000, he received the Keepin’ the Blues Alive award from the Blues Foundation in Memphis. His book, “Motown: The Golden Years” was published in 2001. Dahl’s latest project was co-authoring the amazingly comprehensive liner notes for each of the 12 volumes in the Hip-O Select “Complete Motown Singles” series. Dahl also writes regularly on his Web site. He recently spoke to The Daily Record via e-mail. The Daily Record: What was your first exposure to Motown and how did you become interested in writing about it? 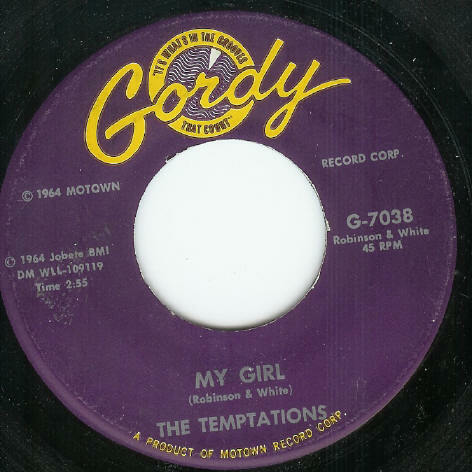 Bill Dahl: I started buying quite a bit of Motown vinyl—the Miracles, the Temptations, Jr. Walker, Marvin Gaye, the Four Tops—during the early ‘70s as an outgrowth of my record collecting interests, which were expanding rapidly from my original love of ‘50s rock and roll. I was getting into soul, blues, rockabilly, etc., and loving it all (much to the chagrin of my mainstream rock-loving high school classmates, who ragged me unmercifully; I guess I never was much of a conformist). TDR: What are some of the more interesting stories or facts you learned in researching these liner notes? BD: One thing that always impresses me is the loyalty the great majority of Motown’s ‘60s artists have to the company and Mr. Gordy to this day. I was fortunate to attend a charity tribute to him a few years ago in LA, and a virtual galaxy of Motown stars performed and paid homage to their beaming boss. Later, all of them trooped up to the stage at the end to sing the old Hitsville fight song! I’ve found it interesting that several of the better-known songwriting teams had a similar setup to that of Lennon-McCartney—if one wrote it, both names went on automatically. It’s been a pleasure tracking down a lot of the lesser-known acts, including a lot of the Rare Earth label rockers, to get their intriguing stories. They’re too often overlooked and made their own contributions to Hitsville history. TDR: What are some of the biggest misconceptions about Motown? BD: The goofy and totally unfounded rumors that the mob was involved with the label, solely because a few very competent Caucasians wielded power in the front office. The only color Mr. Gordy cared about was green, so he hired the best person for the job. There were more than a few R&B labels where “da boys” were in up to their eyeballs (no names here), but Motown wasn’t one of them. TDR: Motown’s big stars get a lot of attention. Who are some of the unheralded Motown artists worth checking out? Were there any long-forgotten gems you discovered as a result of working on the Complete Motown Singles notes? BD: I remember being amazed by Richard “Popcorn” Wylie’s version of “Money (That’s What I Want),” which is on the first Complete Singles box. It sounds like B. Bumble and the Stingers meet Hitsville! Gino Parks’ “Same Thing” (which I knew about already) and several others of his songs are fantastic, as are Singin’ Sammy Ward’s early blues numbers, like “Who’s The Fool.” I love Jr. Walker’s early instrumentals – “Mutiny,” with James Jamerson’s jazz bass solo, is astounding – Shorty Long, Brenda Holloway, Kim Weston, the Velvelettes, and some of Little Stevie Wonder’s overlooked early outings. Los Angeles guitarist Arthur Adams’ “It’s Private Tonight,” which came out on Motown-distributed Chisa (it’s on the 1970 box), is the perfect marriage of blues and soul. TDR: How detrimental do you think Berry Gordy’s favoritism toward Diana Ross was to the label? How much better would Martha Reeves, Gladys Knight, Kim Weston and Mary Wells have fared otherwise? BD: It wasn’t detrimental in the slightest; the Supremes made some of the biggest hits of the ‘60s at a time when the British Invasion was otherwise dominating our charts, and Diana Ross had a coquettish mainstream appeal that none of the rest had. Mary Wells ruined her own career by walking away from Motown when she turned 21. Gladys Knight and the Pips were already stars when they arrived at Motown and far bigger ones when they left, though they got even hotter at Buddah. Kim Weston’s Motown career was inextricably intertwined with that of her husband, Motown A&R chief Mickey Stevenson, for both better and worse. And Martha Reeves and her Vandellas had a series of incredible hits, much like the Marvelettes, that made both groups long-term mainstays. TDR: There has been some disagreement over Tammi Terrell’s involvement on the duet albums with Marvin Gaye that bear her name. Did she return to the studio after her collapse and is that her voice on those songs? What was (Motown songwriter) Valerie Simpson’s role in these recordings? BD: It’s impossible to say for sure, since Valerie has never admitted any possible lead vocal involvement (Marvin Gaye’s biography stated such unequivocally, but I’d be less inclined to buy in). I doubt we’ll ever know one way or the other for sure, though Valerie’s role as co-producer and co-writer on many of them was so crucial that Tammi was no doubt channeling her vocal approach when she sang them (if indeed she was on the last couple hits). TDR: The Complete Motown Singles Collection series ends in 1972. Why stop there? What is your favorite post-1972 Motown single or moment? BD: That was the end of the Detroit era—the Golden Years—so it seems like a reasonable place to end it, though you’d have to ask my boss Harry Weinger (Vice President of A&R for Universal Music – ed.) there. I’m not sure I have too many post-1972 favorites—I’m very partial to the 1959-72 Motown era we’ve covered on the Complete Motown Singles series—but Gloria Jones, Yvonne Fair, Chicago blues guitarist Luther Allison, and Jr. Walker’s “Peace, Love and Understanding” come to mind. TDR: In your mind, what was the greatest single factor in the label’s decline? Was it the departure of Holland-Dozier-Holland, the move to Los Angeles, Gordy’s interest in movies or something else? BD: I don’t think we can accurately say Motown declined, since it’s still a going entity today and enjoyed a ton of hits after 1972. Times change and so do musical tastes, so keeping the same sound in 1972 that sold so well in the mid-‘60s would have been a recipe for disaster. Certainly HDH’s departure was a blow, but that gave other writers and producers more room to create their own soulful magic, like Norman Whitfield. The move to Los Angeles hurt the artists and musicians that chose to remain in the Motor City, and didn’t help the local economy either. Mr. Gordy’s early ‘70s interest in the film industry made him a lot harder to reach on the phone at the time, much to the frustration of some staffers, but artistically it had a negligible effect since he wasn’t all that active musically by then anyway other than with the Jackson 5. TDR: Ultimately, what do you feel is Motown’s greatest and most lasting impact on music today? Why? BD: As the top indie label of the ‘60s, Motown turned the industry on its ear. There had been successful African-American owned record labels prior to Motown—Duke/Peacock, Fire/Fury, and Vee-Jay come to mind—but none were so monumentally successful. Gordy’s mantra of making R&B attuned to pop sensibilities had never been pulled off so convincingly. He also did a masterful job of delegating authority in the A&R department. It sounds like a cliché to say these classic recordings will never die, but they won’t. TDR: Now that this project is over, what is your next venture? Are there any more Motown projects on the horizon? BD: There are no Motown projects immediately scheduled, but I wrote the notes on Reel Music’s CD reissue of Jimmy Ruffin’s fine “Ruff ‘n Ready” Motown LP, complete with a fresh in-depth interview with the gracious Mr. Ruffin, which is just coming out. I’m hoping and praying that Rhino Handmade finally releases the wonderful Wilson Pickett boxed set that it’s been sitting on for more than two years. A recent proclamation on the label’s website says it’s been scheduled. I wrote a huge track-by-track essay for it, much like the ones in the Motown boxes. It’s got everything he did for Atlantic on it and plenty more. Interestingly, the Funk Brothers played on Pickett’s first solo platters for Double L, a fact scantily documented before I started doing research for this box. Ever Fallen For The Buzzcocks? The dramatic introduction to “Reach Out (I’ll Be There)” owes more than a little to Phil Spector’s Wall of Sound and was Motown’s most cinematic chart-topper to date. While the flute gets the signature melody, check out James Jamerson’s uber-melodic bassline bubbling underneath the bevy of instruments. Paul McCartney gets a lot of (deserved) credit for his inventive basslines, but Jamerson’s brilliant countermelody here rivals anything McCartney came up with the Beatles – OK, maybe not “I Feel Fine” – and should permanently insert Jamerson into the ‘60s bass legends conversation. The song was written by the white-hot trio of Holland-Dozier-Holland – there were actually other Hitsville employees at the time, although one wouldn’t know it by looking at the Billboard charts – but Norman Whitfield supplied the galloping percussion. Propelled by HDH’s rich arrangement, “Reach Out” starts strong and continues to build through the verse, dropping off and resting slightly before the Tops casually fall into the chorus. Lyrics could almost become superfluous with a melody this strong, but lead singer Levi Stubbs’ words of commitment and devotion are equally compelling. Although the song became the Tops signature number, Stubbs initially felt his voice was too rough for the song and tried to recuse himself. Fortunately, HDH prevailed on Stubbs to give it a try. Stubbs promptly delivered one of the great vocals in the Motown catalog. Critics who pick on “overproduced” songs like this as examples of the slick Motown sound need to pay more attention to Stubbs’ vocals. His signing is as gritty and soulful as anything in the Stax cannon. Marvin Gaye and Smokey Robinson may sound a little stilted in singing in front of Stax’ incredible house band Booker T and the MGs. It’s not hard to imagine Stubbs being more than up to the task. Unfortunately such cross-pollination never occurred, but with the advent of ProTools and continued merger of major record labels, maybe the Motown and Stax catalog will end up under the same corporate umbrella and someone will give us a recreated session. Stubbs’ soulful signing on “Reach Out” inspired a lot of people – unfortunately it inspired a lot of the wrong people. While the ability to sing soul music is not racial, a whole lotta white dudes certainly tried to make the case. Elton John, Michael Bolton and Michael McDonald all failed on this number. More successful were Diana Ross, who took her cover into the Top 40 in 1971, and Gloria Gaynor, who did a disco version just four years later. After a sharp blast of horns and drum roll from “Pistol” Allen, the song drops to a tinkle of glockenspiel that would make Bruce Springsteen proud and slowly builds, with a crescendo at the chorus. There’s a whisper of guitar and the rumble of James Jamerson’s bass, but Paul Riser’s arrangement is essentially David Ruffin and the Tempts’ voices, horns – complete with trumpet solo! – and that magnificent snare. It was more than enough. Contrast the prominence the other Temptations are given with their backing performance in this song to the anonymity Mary Wilson and Florence Ballard of the Supremes were often given. As part of the Holland-Dozier-Holland team, Eddie Holland certainly knew how to write and arrange interesting counter-vocals. It makes one wonder how much influence label owner Berry Gordy exerted to push Diana Ross to the front and minimize the contributions of her bandmates. Although the title seems enlightened, few women would regard a lyric like “A pretty face you may not possess/ But what I like about it is your tenderness” as a compliment. Whitfield actually recorded the song’s backing track two years before he added the Temptations’ vocals. In the interceding time he shopped it to several Motown artists, including David Ruffin’s brother, Jimmy, and the Miracles, who included their version on the “Away We Go-Go” album. (Never one to miss a trend, Gordy also released “The Supremes A Go-Go” album in that same summer of 1966.) The Ruffin and Miracles versions are the only substantial covers of the song on record to date. The intro to Holland-Dozier-Holland’s masterpiece “You Can’t Hurry Love” is a lesson in how to build a Motown hit: Start with the bass and percussion, add some horns (or strings) and then have a pretty voice jump into a catchy verse. When this song was recorded, Ross was little more than a year away from getting top billing and four years removed from going solo. Even still, Mary Wilson and Florence Ballard are little more than anonymous backing singers in the mix. Although the track is as perfect as a song can be, it’s a shame their talent wasn’t given greater prominence. While this song may be held up as Exhibit A by haters who think Motown is too slick and soulless, it is also testament to how smoothly the Motown assembly line was working. The song was recorded in just two sessions. Presumably the Funk Brothers laid down everything but the vocals at the June 11, 1966 session and the Supremes added their vocals at the July 5 session. Little more than three weeks later, the single was on the radio. By September, only three months after initial recording, it sat at No. 1 and earned the trio a high-profile performance on the Ed Sullivan show. “You Can’t Hurry Love” had a renaissance in the 1980s. Phil Collins took it to the Top 10 in 1982, the same year the Stray Cats put it on the flip side of “Rock This Town.” Whoopi Goldberg sang it in her 1986 film “Jumpin’ Jack Flash,” and former Jimi Hendrix/Electric Flag drummer Buddy Miles sang it as the voice of the California Raisins (which, sadly, was the first version The Daily Record heard and its non-oldies radio introduction to classic R&B). It may seem hard to believe, but “the sound of young America” is 50 years old. To celebrate a half-century of Motown records, the Rock and Roll Hall of Fame in Cleveland is hosting a new exhibit, “Motown: The Sound of Young America Turns 50,” all year in the Ahmet M. Ertegun Main Exhibit Hall. Of particular interest to Kramer are four posters promoting Motown concerts. Two of the posters advertise Motown Revue shows, which featured several of the labels artists on the same bill. Together, the posters span five years and a range of venues from a high school gym to a civic sports arena. Other items in the exhibit include the dress Supreme Mary Wilson wore for the group’s first appearance on the Ed Sullivan Show after the departure of Diana Ross, the outfit and glasses Stevie Wonder wore for his halftime performance at the 1999 Super Bowl and a stage costume worn by Miracle Bobby Rogers in the 1970s. Thanks to a loan from the Universal Music Group, which owns the Motown label, many of the artifacts have never been displayed before. For many of the Motown session musicians, playing for Hitsville was just another gig. But 50 years later, the notes they laid down still resonate. To learn more about museum hours and ticket information, visit the Rock and Roll Hall of Fame Website. Lightning definitely struck twice for Smokey Robinson and the Temptations. 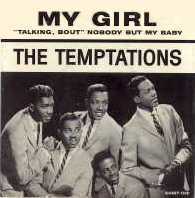 After struggling for years, Robinson gave the Temptations their breakthrough hit with “The Way You Do The Things You Do.” “My Girl,” their follow-up, is not only Motown’s biggest song, but one of the biggest soul numbers of all time. Inspired by his wife Claudette, Robinson and fellow Miracle Ronald White wrote the one of the greatest Valentines of all time as an answer song to their previous hit “My Guy.” Bob Dylan may have been thinking of the lyric “I’ve got so much honey/the bees envy me” when he proclaimed Robinson “America’s greatest living poet” in 1965. David Ruffin made his lead vocal debut delivering these deceptively simple lyrics. Though it seems a no-brainer in retrospect, the decision was controversial at the time. Eddie Kendricks and Paul Williams had shared the lead role prior to this song, and, to make matters worse, Ruffin was a ringer who replaced original Temptation Al Bryant. Ruffin got the nod after Robinson saw him singing “Under the Boardwalk” as part of their Motown Revue repertoire, and quickly became the group’s featured singer. The Motown string section furthers Ruffin’s references to sunshine and fluttering birds, while Funk Brother James Jamerson’s signature two-note bass line anchors the entire performance. It’s unclear why Robinson and White didn’t keep their song for The Miracles, but it didn’t take long for other acts to put their stamp on the number. Otis Redding added some blues for his 1965 reading; both the Rolling Stones and the Mamas and Papas cut it in 1967. Since then, everyone from Al Green to reggae artist Prince Buster to Dolly Parton to British shoegazers The Jesus and Mary Chain has reinterpreted this timeless classic.